My single most notable physical feature is my nose. I’ve got a beak, a schnozz, a honker. It’s so meaty that it makes my eyes and mouth look small by comparison. I used to be pretty sensitive about it, but it doesn’t bother me too much anymore. What is it about the nose that makes it so…well, so rude? It’s just a lump of skin and cartilage with two holes in it, but there’s something about it. Maybe it’s the position of prominence it occupies dead center in the face, or the way that a sneeze coming out of it can contort the whole body. Whatever the reason, the nose has a powerful idiomatic role in the English language. Dozens of sayings and proverbs employ it — “nose to the grindstone,” “keep your nose clean,” “rub your nose in it.” It carries a certain power, and that’s why I’ve come to love my big nose. 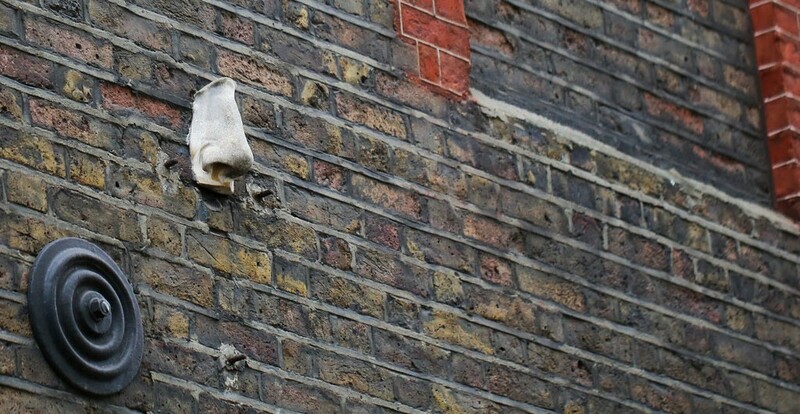 When artist Rick Buckley wanted to protest the increasing use of closed-circuit television cameras to spy on citizens in London, he decided to follow his nose out to the streets. The development of the surveillance state came early in Britain, with Liverpool police experimenting with camera installations as early as 1964. The 1993 IRA bombing of Bishopsgate in London spurred the creation of the “Ring of Steel” around the city’s financial district, and security continued to heighten over the next few years, with the Home Office spending £38 million on camera programs. The citizens started to rankle at this constant surveillance, and by 1997 the UK was seeing protests in the streets. Rick Buckley was energized by this public resistance and wanted to make his own statement about CCTV cameras. Buckley took a cast of his own nose, then mixed a plaster and polymer compound to match the colors of different kinds of brickwork. When the noses hardened, he took to the streets with a toothpaste tube full of glue, sticking them onto hard-to-reach spots. 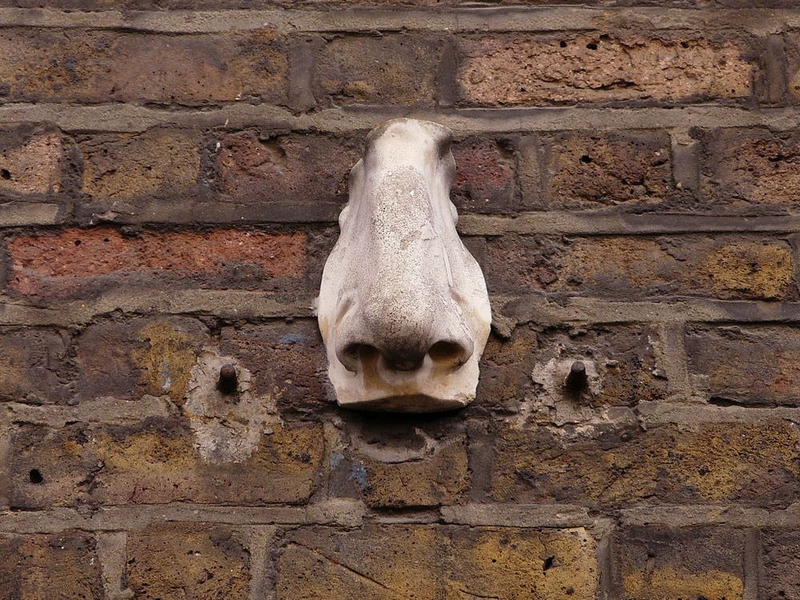 In one night, Buckley installed some 35 plaster noses on many notable London buildings, “under the nose” of the newly-installed cameras. Most of the noses were removed pretty quickly by property owners, but some held on throughout the years. It’s hard to say why they weren’t taken down, but possibly people just had better things to do. Buckley didn’t take credit for the art activism until 2011, when only a handful of noses remained. In the interim, urban legends about their placement and purpose spread. One popular tale said that the Admiralty Arch nose was installed as a spare in case the one on the statue of Nelson in Trafalgar Square ever fell off. Another says that if you hunt down all seven noses in Soho on a single day, you’ll be rewarded with fabulous wealth. Oddly enough, Buckley’s noses aren’t the only mysterious body parts on London buildings. Several years later, artist Tim Fishlock took casts of his ears and replicated the project across the city. Two of those still remain on buildings in Covent Garden. And there’s even speculation that one of the noses, on Meard Street, was put up by still another imitator. Twenty years out from Buckley’s project, the London noses have lost much of their original significance. We’ve come to accept the loss of public privacy as just another part of modern life that we can’t sniff away. A few CCTV cameras here and there are nothing compared to a world that’s constantly streaming on YouTube. Buckley’s nasal protest was ultimately ineffective, but it did result in some truly weird public art. So next time you’re in London, follow your nose to the noses. Even if you don’t get lucky enough to spot all seven, you’ll see one of the most unique public art projects in the city. You can find the noses of London at Admiralty Arch, Dean Street, Great Windmill Street, Meard Street, Endell Street, Floral Street and Bateman Street.